Instead she started laughing and told me that he was out in the truck in front of our house. 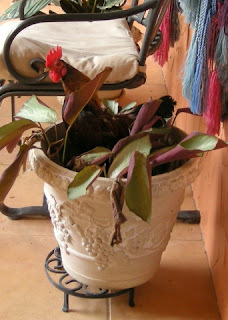 They had gone to visit her mother for the day, took the rooster with them, and then brought him to our house! His leg was tied to the hooks on the pickup bed. 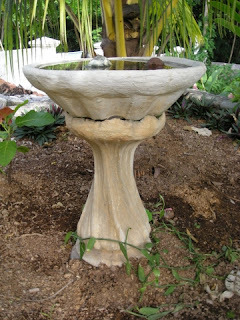 The sad (and shameful) reason is that even though they live in a nice middle-class colonia in La Ceiba and their yard is completely fenced with a concrete muro, they can't leave anything outside without it being stolen. They've lost chairs, toys, bicycles, and a million other things of practically no value. They've lost things at night, during the daytime, when they've only walked a block away to the pulpería (convenience store), and even when they have been at home. They plan to get a cage for the rooster, but in the meantime, either someone stays at home at all times to guard the rooster or they take him with them! Not only would the rooster be something free, but it is also something to EAT − a double theft-threat. Another friend who lives in a very upscale community had her hen stolen. Once I gave her some Moses in a Cradle (Rhoeo spathacea) for her garden. 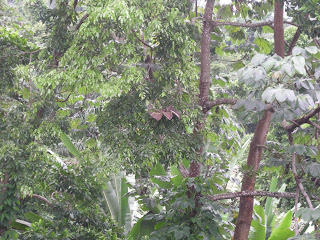 This is an extremely common plant in Honduras. 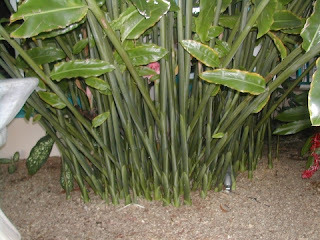 It's easy to start from cuttings and spreads rapidly. There is no need to buy it, ever. We bought four tiny plants and now could cover an average sized lot with it if we wanted to. She was going to plant it around the outside of her fence. 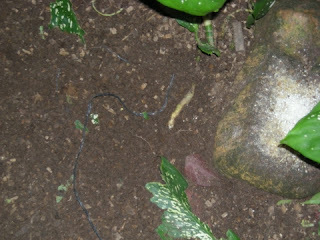 She left the cuttings there for a few minutes while she went inside to get her garden tools and when she came out, it was gone. All of it. But, back to the rooster: The kids have turned him into a pet parakeet-rooster. They love their rooster. All they have to do is hold out their arm and the rooster hops up on it and sits like a parakeet while they pet him. That is just too funny. Sorry I don't have a photo of it. 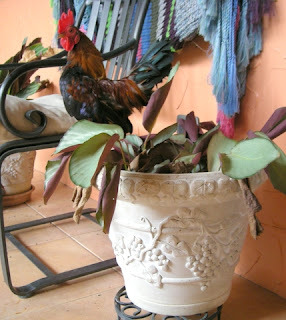 The photo above is of our first rooster, the beloved Ramón who sadly has gone to rooster heaven. Early on in our life in Honduras, we subscribed to La Prensa newspaper. 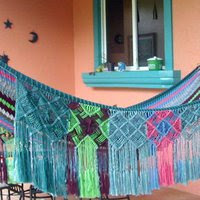 It was relatively inexpensive and a great way for me to practice reading Spanish as well as learn more about Honduras. If I remember, the first years were somewhere around L.1,200 or L.1,400 (which using the exchange rates at that time was around US $70-80 per year). Shortly after we moved in to our new house, our subscription was about to run out and the nice lady called as she always does to ask when they could send out someone to pick up our payment for the new renewal subscription. Mail service is so undependable that payments are never sent by mail in Honduras. When the man arrived the next day, however, he handed me a bill for L.2,400 (about US $135). I was shocked that the rate had gone up so much. I asked him to check to see if they had a special renewal rate for long-time customers and told him that I wouldn't be renewing at that rate. The next day, the lady called to say that L.2,400 was the new annual rate, and nicely told me that if I couldn't afford it, I could renew at L.1,200 for 6 months or L.600 for 3 months. I'm always a little taken aback by comments like this. I tried to explain that it wasn't that we didn't have the money, it was that we just thought it was too large an increase. About a week later, the La Prensa lady called to say that they were having a Valentine's Day special with annual subscriptions for L. 1,400. Sold! El Jefe decided at that point that I was the person to handle newspaper subscriptions in the future. He was impressed. The next year, we went through the same dance. Rate too high. No renewal. Surprise Dia de Mujer or some other holiday special a week later. Rate: L.1,100. Sold! I know that you readers understand. It's not that you don't have the money for something that you may want, it's just that you have your own personal mental value for what you think something is worth. For some things you bite the bullet and pay the price and for others you just do without. 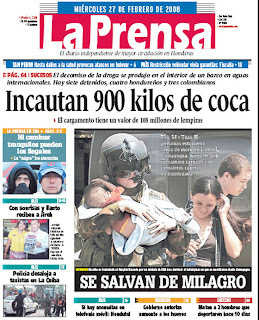 Besides, La Prensa is available on the internet although for some reason, I enjoy reading the actual paper copy better. Around February 10th this year, Katia (I think that is her name − my telephone Spanish comprehension is rough) called to let me know that our subscription was about to run out again. She said, "Doña (gringa), I know you like those specials but unfortunately, this year we won't be having a special offer. The new rate is L.2,700 for a year. I'm sorry and I hope that you'll renew." I said that I was really sorry, too, but I would just have to cancel my subscription. Today, February 27, I forgot to turn on my cell phone. When I did, I saw that I missed five messages from La Prensa. Ahah! Shortly after that, Katia called again, sounding very excited, and told me that she received authorization to offer us an annual renewal at L.1,700. (That is US $90 compared to the original US $143!) "That's wonderful," said me. "When would you like to come out to pick up the check?" We made arrangements and starting Friday, I will be back to being a regular La Prensa subscriber and reader again. I suppose that it sounds like I'm a real cheapskate! I'm really not. I rarely bargain or haggle with anyone. I find most prices reasonable or even low. We know how much workers should make and we don't ask them to take less even though many of them probably would, since jobs are hard to find. I generally just decide if the asking price is worth it to me, and if not, I walk away. Sometimes the seller will come back with a better price. I really don't care if someone is selling potatoes for a few pennies more than the guy across town or if I pay a dollar or two more to have a broom delivered to my door instead of shopping around for a better price. It does feel good to get a bargain, though, doesn't it? 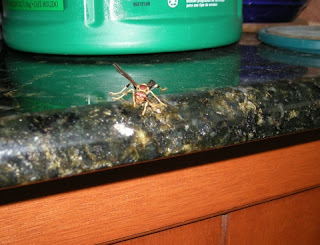 Moving along with my theme of using some of my stockpile of photos, here are some bugs that have been in the house. No Latin names or good stories, just photos, but you are welcome to chime in with names if you like. I don't mind these occasional visitors too much. 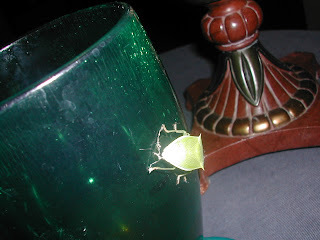 Usually if it is a moth or something that I can catch, I put it outside. 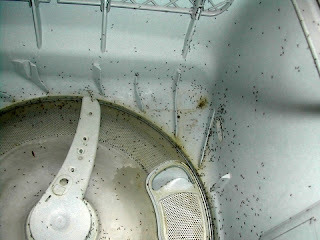 Surprisingly, we have very little trouble with mosquitoes, flies, or cockroaches inside the house. Apparently the geckos are eating them. Too bad I didn't get a photo the time that we discovered a mama scorpion and about 50 babies when we moved some wood laying on the floor inside the house. We were too busy stomping to even think about getting the camera. 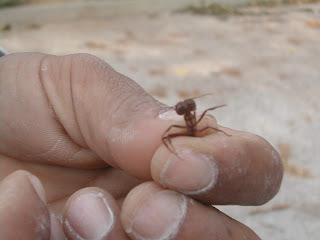 Ants can be such pests but they do serve their purpose. They clean the house of any crumbs or dead bodies instantly. The first photo shows some ants carrying off a dead beetle. The second, sorry, disgusting, photo shows them hauling off a dead gecko that was under the sofa. In the third photo, a tiny ant is valiantly trying to take that chicken feather home to make a feather bed. 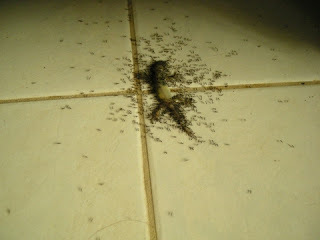 Yes, the ants are pretty bad here in Honduras. Most of the serious invasions come when the weather has been very dry. 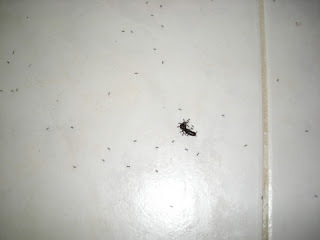 I think that these black ants come inside looking for water. 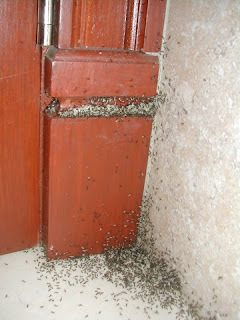 Someday, I have to write up an article on zompopos, the one insect in the world almost as destructive as man. I have some great pictures. Just as a teaser, take a look at this photo. You do not want to mess with these guys. 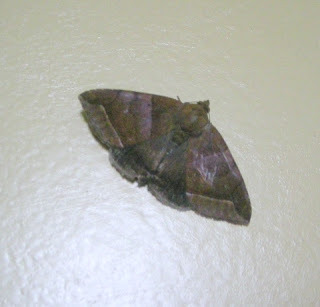 They have come into the house a couple of times. When they do, we take the dogs and go upstairs and hope that they are gone by morning! Vinegar or citrus oil don't even phase them. These ants draw blood when they bite. "Hasta la vista, baby. I'll be baaaaack!" Whenever I get pressed for time, I look through my photos to see if I can find a quickie to post. I am hundreds and hundreds of photos behind, but unfortunately, most of them require some explanation or research or something so they will just have to wait. Most of the photos aren't bad and will serve their purpose whenever I get around to writing the article. I did get a laugh out of a few of them, though. I know exactly what I was trying to take a picture of even though some of them are old. 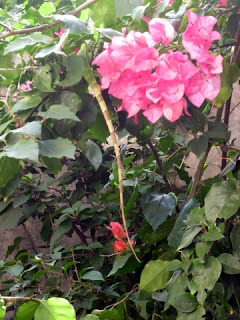 Oh, and that photo at top: I was taking a picture of the strange red leaved plant − which I later realized was only new leaves that had fallen from another taller tree. 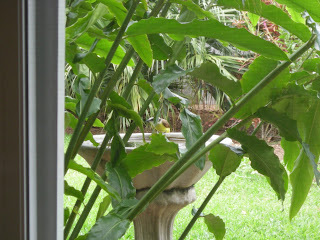 But after looking at it closer, am I crazy, or is there a big bird in that photo just above the red leaves in the center? All I have to say is that I really admire people who can get good wildlife photos. 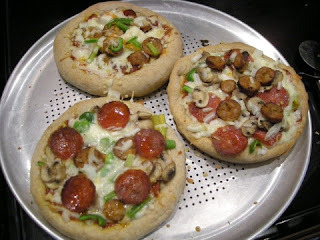 Homemade pizza party review -- Thumbs up! Because of the water situation (it didn't come back until about 3 p.m.), I was horribly behind schedule. But that worked out okay because half of our guests were almost three hours late. I was glad! 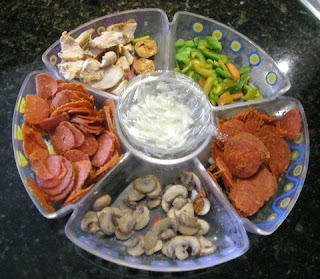 I kept the first guests satisfied with veggies and ranch dip while I continued preparing the pizza ingredients. Pizzas were a great idea! They loved them and it was so much fun. Also, since only a few pizzas were prepared and baked at a time, there was less pressure on me, hostess, cook, dish washer, and waitress, to get everything ready and serve it all at once. The breakfast room table was big enough (and in close proximity to the television) that we could rotate from the sala familiar (family room) to the breakfast area as each batch of pizzas were ready. 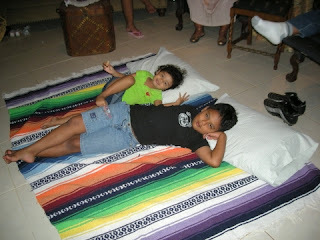 The little ones had this comfy spot on the floor for movie watching (and napping). We didn't have to use the dining room or stop the movie while we ate. Good thing there, because we have moved the dining room table up to the bedroom for the time being for use as a sewing table. I told El Jefe to get movies that the kids would like and not to worry about me since I wouldn't have time to sit down to watch it anyway. He got the Transformer movie and they played it so incredible loud that I thought I was going to lose my mind! He even hooked up the stereo speakers to the new TV. Since we started so late, we only played one movie. What a joy for me when it ended! During the evening when I was inquiring whether someone needed another drink or whatever, no one could hear my pitiful little voice. When I would use my LOUD voice, everyone would stop dead and stare at me like, "Why is that gringa SHOUTING?! Is she angry about something?" Finally, when I had an announcement to make, I had to ask El Jefe to pause the movie. It was that loud. One announcement was, "Who wants to make the first pizzas?!" Little Elias, who is 7 years old, raced to the kitchen, saying, "Me, me, me! ", followed immediately by his older brother and sisters. I informed them that the first step was to wash their hands muy bien which they dutiful did, with older brother reporting that Elias did not use soap. That omission was rectified in the kitchen. While I prepared a healthy chicken and broccoli pizza for la abuela (the grandmother) who can't eat spicy food, the kids followed step by step, with Elias saying, "Don't do it for me. I want to do it!". They did an excellent job. Elias called his dad in to the kitchen to show off his pizza and even trained the grownup guys when it was their turn. 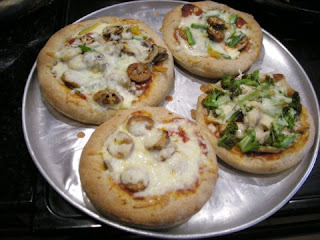 This photo shows the kids' and grandma's pizzas. Elias' pizza is the one at the bottom. I asked Elias if he would share his pizza with his 3-year-old sister and he readily agreed. He usually eats like a bird and feels pressured because everyone thinks that he doesn't eat enough. But, he ended up eating his entire pizza all by himself. When I asked if his pizza was better than Pizza Hut's, he said yes. Heh, heh, heh, I agree. Isn't Abby a little doll? 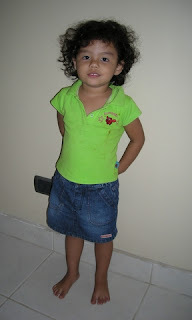 There is something about this pose that makes her look so much older than three. I think everyone got a big kick out of making their own pizzas. Everyone thought the broccoli and chicken pizza was really weird, but la abuela, who said she would only have one piece, ate every bite of the whole pizza. Low on sauce and cheese, I think it was pretty healthy for her. We are definitely going to do this again. I may have finally found a theme that makes it a little easier to deal with the stress of cooking for so many people. I made pizza crusts on two separate days during the week and stored them partially baked in the freezer. All of the ingredients were prepared ahead of time and could have been prepared the day before. Look at all these leftover ingredients. We may have a few more pizzas this week. Oh, and I win the $100 bet. Brother-in-law M asked how I made the sauce and sister-in-law B may be coming over one day this week to learn how to make pizza dough. Funniest moment: I missed the conversation that prompted this, but after dinner, El Jefe got out the scale and everyone weighed themselves. Wow, what a shocker that was. Most of them went back again, thinking the first number must have been a mistake. I think we should ALL be eating broiled chicken and steamed broccoli instead of pizza. By the way, Abby weighed 34 pounds. I'm not telling on the rest of us. Worst moment: I made the baklava Friday night. The recipe said that it should be kept at room temperature. 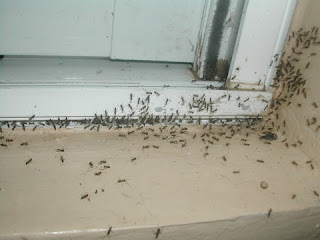 In Honduras, it is extremely difficult to keep anything out, especially something very sweet and sticky, without having it invaded by ants. The pan had a plastic cover but I had my doubts about whether it was tiny-crazy-ant-proof so I kept it covered inside the oven. All day long, I kept repeating to myself, "Don't forget to take the baklava out of the oven before you turn it on. Don't forget to take the baklava out of the oven before you turn it on. Don't forget to take the baklava out of the oven before you turn it on." So, naturally, I did forget. When I opened the preheated 450°F oven, I screamed, "Oh, noooooo!" and everyone came running. 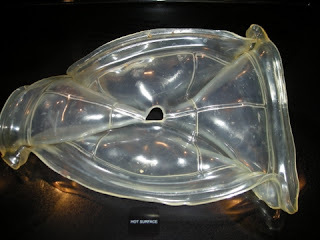 There was the hot baklava with a wildly misshapen melted plastic lid. Not only did I not have another dessert, but this dessert cost a FORTUNE to make. Luckily, the lid distorted itself up and out rather than melting on top of the baklava. I am so exhausted today. I feel like I ran a marathon yesterday. Next time....I'm going back to my gringa ways and I'll do more ahead of time preparations. While trying to adapt to the Honduran culture as many think that I should, I did no planning ahead* for contingencies on this party. I have run into a major glitch. I guess the PC crowd would say, "Oh, we didn't mean adapt to the culture in that way. We meant the other things. The things that we approve of." 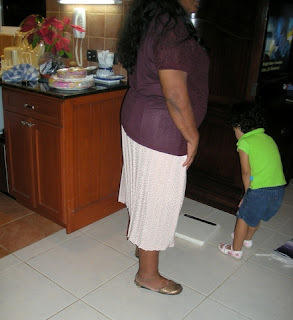 Last minute food and cleaning preparations for a party, in the Honduran style: What does that mean? Why, of course, that means that the water will go out! The electricity will probably go out tonight when I start baking the pizzas. *Funny story about planning ahead: I've heard recently that some people buy their baby's diapers one at a time throughout the day, as if maybe if they wait, they might not need another one. Well, I had to make sure the baklava was okay didn't I? We are having a movie and pizza party for the family tonight. The house isn't clean, I still need some groceries, all I have prepared is Baklava for dessert and 15 6- and 8-inch partially baked light whole wheat pizza crusts. Most of this meal came from San Pedro: mozzarella cheese, Italian sausage, pepperoni, whole wheat flour, real butter, walnuts, almonds, and, of course, the phyllo dough. All have been stuffed away in the freezer since last month. Thank you San Pedro Sula! The family loves pizza, but won't the guests be surprised when they find out that they are going to make their own pizzas! I think the kids will really enjoy that. $100 says that my sister-in-law B will ask for the recipe. P.S. I think the baklava is going to be a big hit! We'll see. 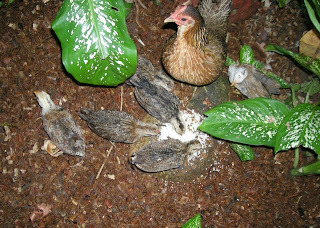 In our batch of chicks we had three roosters and three hens − which, incidentally, I predicted based on the egg shape. I'll have to test my theory again next time by taking away all the pointy rooster eggs. We recently gave away two of the roosters. It takes a little time to tell which ones are hens and which are roosters. Then I wanted to wait to pick out the best looking rooster to keep. 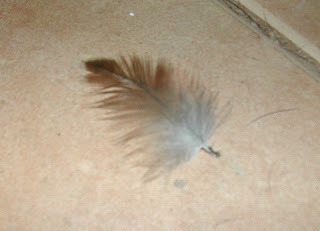 All three were similar, but the one that we kept has brighter feathers on his shoulders. Roosters are feisty guys. It's good to have one, because everyone feels better with the natural order of things. 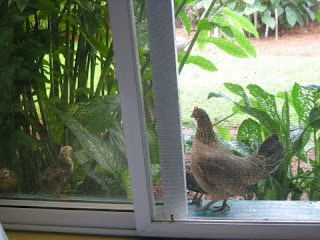 The roosters protect the hens, decide the pecking order, and announce the start of the day (over and over again). 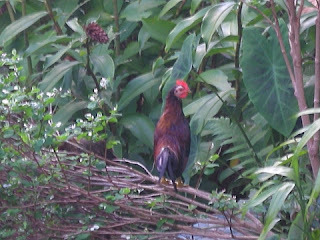 With more than one rooster for a small number of hens, though, jealousy and machismo set in and they tend to fight. We gave one rooster to my sister-in-law. I'm not sure why she wanted a rooster instead of a hen but the kids were so excited to get him. Hopefully we'll have another hatch of chicks before long and can give her a hen or two as well. The other rooster we gave to our water delivery man. I didn't know that he already had a full size rooster (ours are bantams, kind of miniature chickens). He told us today that our little guy has beaten the heck out of his big rooster, doing some real bloody damage. He wanted to get a bantam to breed with the one bantam hen that he has. The bantam hen has other ideas, however, and is sticking with her turkey buddy. That must be a sight to see. Our rooster has other ideas, too. 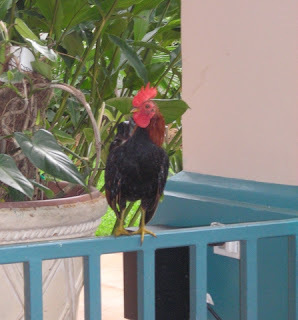 According to the water guy, his full-sized hens always ran away from the big rooster. He said that our little guy jumps on their backs, grabs them by the neck and has his way with them. 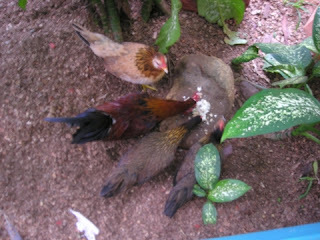 The hens are as nonchalant about it as if there is a garrapata (tick) on their backs and go about their business as normal. So little rooster is in hen-heaven and not getting any flack from the big guy anymore either. He is a good-looking guy, isn't he? This is a recipe that I make to fool myself into thinking that I'm eating rye bread. Heheh! I haven't ever found rye flour in La Ceiba so this is as close as I can get. It's a lazy recipe, using the bread maker for making the dough. I always shape and bake the loaves and rolls by hand, though. It just isn't as good baked in the bread maker. If you don't use a bread maker, just use your normal procedures for mixing, kneading, and rising the dough. If you want to bake it in the bread maker, cut the recipe in half as this recipe will overflow your machine. Place all ingredients except herbs in your bread machine in the order recommended by the manufacturer. Process on the dough cycle. Adjust the flour or water if the dough is too stiff or too sticky. It should be a relatively heavy dough but not dry. Add the herbs and seeds at the beep or towards the end the last knead cycle if your machine doesn't beep to remind you. When the rising cycles are complete, remove the dough from the machine to a lightly floured pastry board. Punch it down, cover with a clean cloth and let the dough rest for 5 minutes. Turn on the oven for one minute and then turn it off. I usually knead it by hand a few times after that just for good measure and then shape into two long free form loaves or a couple of dozen dinner rolls. Place on a lightly greased cooking sheet(s). 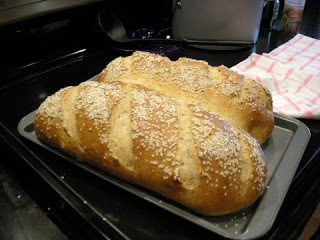 Prepare the optional glaze, brush on the loaves, and sprinkle with sesame, poppy, or caraway seeds. Slash loaves on the diagonal, if desired. Check the oven to make sure that it is just barely warm but not too hot. Let the loaves rise in the warm oven for about 25-30 minutes or until not quite double. Remove from oven, cover with a cloth while you preheat the oven to 425°F (218°C). When the oven is preheated, place the pans inside and reduce the temperature to 400°F (204°C). Bake about 20-25 minutes for rolls or about 30-35 minutes for loaves. The inside temperature of the loaves should be about 200°F (93°C) when done. Enjoy hot with a slather of butter! Really scraping the bottom of the blogging barrel here, huh? 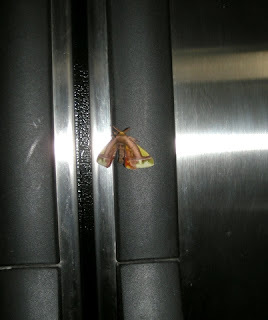 And, no, it isn't to fly off on either. 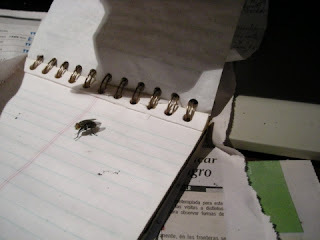 :-) It just goes to show that even the most mundane things can be a different experience here in Honduras. 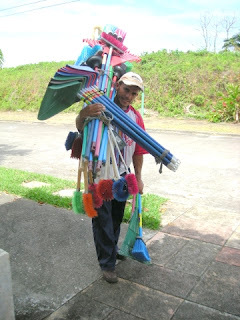 I just thought you might be interested in Honduras' answer to the Fuller Brush Man of the U.S. 1950's. These men walk around colonias (neighborhoods) selling an assortment of brooms, brushes, and other household cleaning tools. It is an incredible load. Sometimes you can barely see the man underneath the products and since all the handles are wood, I imagine that it is quite heavy. I have been complaining about my broom. 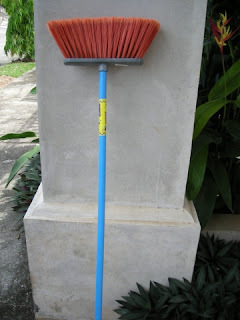 I keep one broom for outside and one for inside, but somehow, Frank always got a hold of my inside broom and used it to 'scrape' the sidewalks, causing the bristles to get all messed up, which in turn makes it difficult to sweep as the mangled bristles seem to send the dirt flying in every direction when I sweep. A minor annoyance, but I decided to take a look at what this guy was selling. He was asking L.80 (U.S.$4.23) for the brooms. I had a wad of cash in my hand but not that much because the last time I bought one in the grocery store, I think I only paid about L.40 or L.50 (US $2.12-$2.65). I told him I didn't have enough, mostly to see if he was trying to overcharge me. A quick retreat from the original price usually means that the vendor was just giving it a shot to see if you would fall for it. He asked how much I had. I counted it and said L.55. 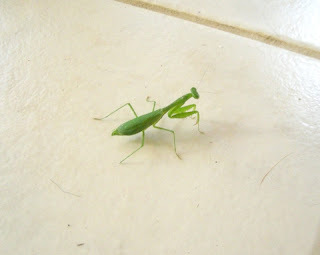 Then he offered to give me credit for L.25 (US $1.32) until the next time he came around − in about a month! That always makes me feel so bad when these poor people offer to give me credit! So, I asked him to wait a minute and I scrounged around the house and found L.25 in my water money stash. 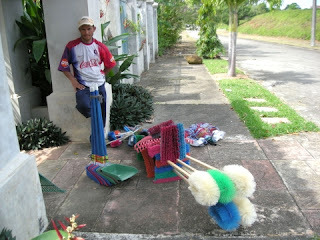 So, I got my new broom and he made his sale − without having to finance the extra $1.32 for me. We were both happy. Oh, man! 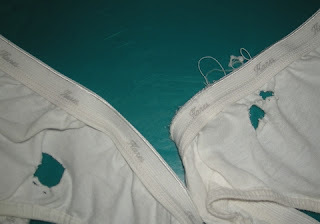 My (almost) brand new imported-from-the-US cotton Jockey underwear! 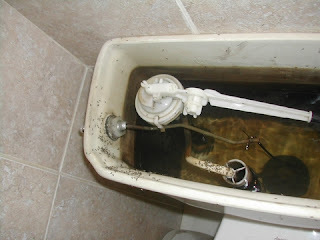 I sorted the laundry on the laundry room floor but the water went out and I couldn't wash. Each time this happens, I have to run a cycle on the washer to make sure none of the black water was in the pipes, and then we would have to go somewhere and I couldn't get the laundry done. The next day, the same thing all over again. Meanwhile, the pups discovered the laundry handily left within their reach and decided they would make fun chew toys. It wasn't just these two. They chewed up all of them! I tried sewing them but most were hopeless. Rips I can sew but these were giant holes. Calabaza is the general Spanish word for winter squash. 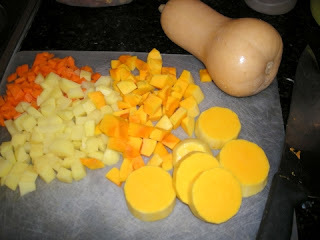 Butternut squash are called ayote here in La Ceiba, but apparently other types of squash are also called ayote as well. The vines, as squash vines will do, tried to take over the earth. We ended up with probably 100 squash. 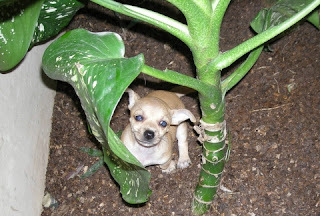 We gave some to family and the few workers we had a the time, gave some to Carlos to sell at the market, and I even tried to trade some with a thief who was trying to steal my garden spading fork. I searched for new and different things to do with squash. Fried squash chips were good, but I try to avoid fried food. 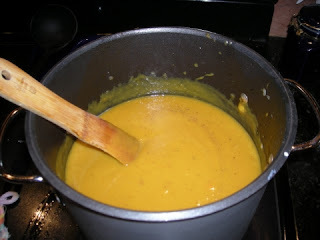 I found a couple of recipes for butternut squash soup which I modified and came up with this recipe. As with most of my recipes, it's flexible and you can add or omit or adjust as suits your tastes. In a large pot, melt butter over medium heat. Stir in onion, garlic, and ginger. Cook until tender, about 5 minutes. Stir in carrots and celery, cook another 5 minutes. 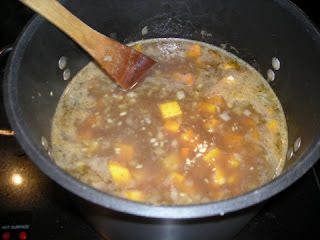 Add liquid, potatoes and squash, vinegar, brown sugar, and thyme. If you are using water, add a little salt. The liquid should cover the veggies. 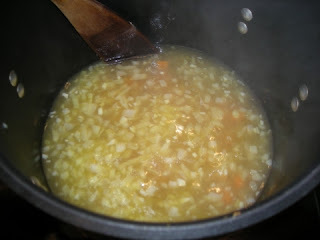 Bring to a boil, reduce heat, cover, and simmer 30 to 45 minutes, or until vegetables are very soft. Remove from heat. Cool slightly. Working in batches, transfer mixture to blender or food processor and purée until smooth. Return puréed soup to pot. Stir in the chipotle and season to taste with salt and pepper. I sometimes add 1/2 to 1 cup of milk at this point, but the soup is nice and creamy without it, too. 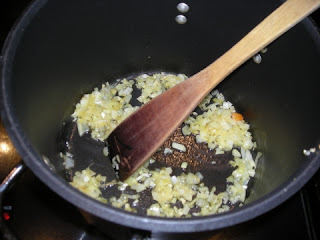 If the soup is too thick, add a little more water or broth. Heat thoroughly. Ladle into bowls and top with croûtons and a dollop of sour cream, mantequilla blanca, or fresh homemade yogurt. Hints: Start on the low side with the chipotle and add more to taste. This soup seems to get spicier the next day. If you don't want the spiciness at all, leave out the chipotle and the brown sugar as well. You could substitute other yellow or orange-fleshed squash for the butternut or even use part sweet potatoes and part squash. In case you don't know, chipotles are smoked, dried jalapeños in a thick smoky, spicy sauce. I buy a can, scrape out the seeds as much as possible (a messy job), and then purée the chipotles and sauce in the blender. Then I freeze the sauce in an ice cube tray and later transfer the cubes to a plastic freezer bag as a little goes a long way for us, even though we like spicy food. 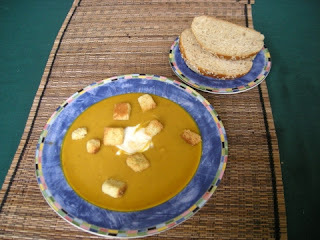 I served this soup with Herbed Wheat Bread. It was a filling meal. Warning! Warning! Warning! Red Alert!